I hope you are enjoying the sun we are currently having, I myself am hiding from it as much as I can as I prefer the cold (I know I’m weird). 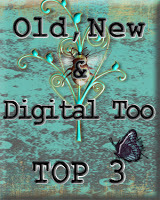 However, I return today with a post. 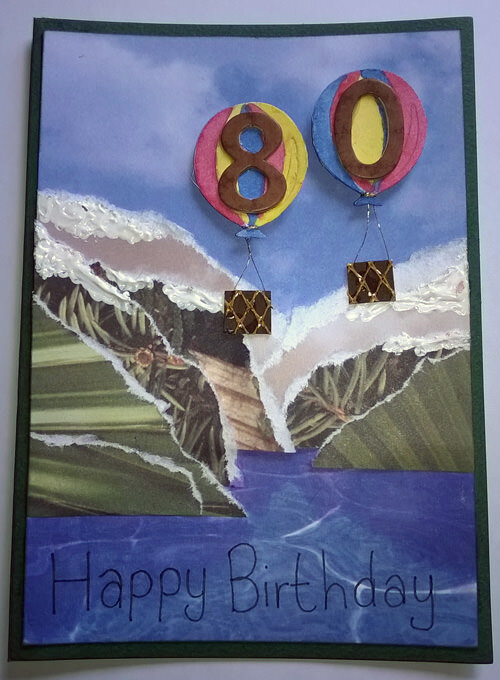 Many apologies for being absent last week, I have been rather busy with my Dad sadly still in hospital (now into 5 weeks), however, this week I thought I would review June birthday crafting which I wasn’t able to post at the time, so here is the first which features my Dad’s Birthday Card for a big birthday. Totally inspired by my recent visit to Norway, which was so beautiful, I recreated a beautiful Fford by paper piecing a selection of papers representing the mountains, sky and sea. I added white acrylic paint, very heavy handed to simulate the snow on the very tall mountains. 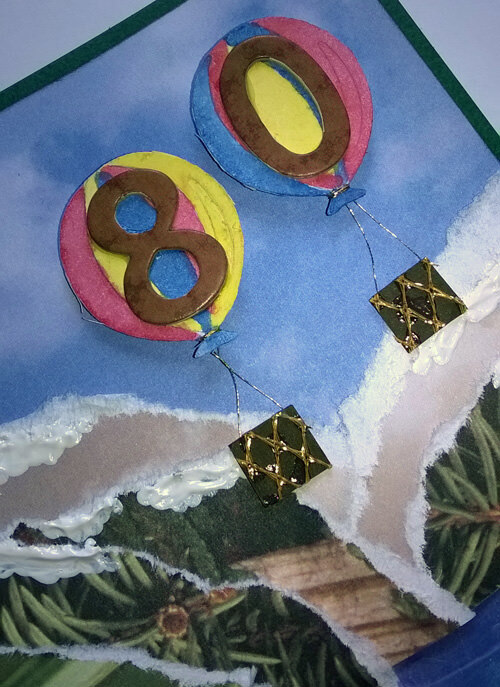 My Dad is fascinated with Hot Air Balloons, and I have featured them before in previous years, but I thought it would make a perfect venue for the much needed addition of the number 80. I die cut the balloons which I watercoloured and added the numbers. I made the baskets using an oddment of webbing. 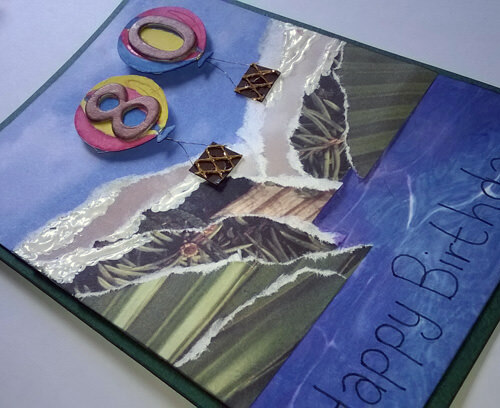 This entry was posted in Cards and tagged Birthday Card, Fford, Handmade card, hot air balloon on June 28, 2015 by blackflowercreative. The last of my UFO naming and shaming and this one was one of the first patterns I attempted. I remember I had been ill and was looking at various pictures on the internet and decided to give this one a go. It looks to me like all the pieces are made, they just need sewing together and my Monkey will be finished. This entry was posted in Amigurumi on June 21, 2015 by blackflowercreative. I was tickled when I found this little guy, who only needs some eyes and that was enough for him to remain at the bottom of my box for months on end. Poor little chap! He was a little set I bought cheaply just to gather another angle on how to make Amigurumi animals. I followed the instructions which to me were a very strange way of making him and I thought I could have simplified it if I was to make him again, anyhow this one is made. I didn’t use the wool which came with him, because I wanted to see how my multicoloured wool would look. I wonder how long it will be until he has eyes. This entry was posted in Amigurumi on June 18, 2015 by blackflowercreative. 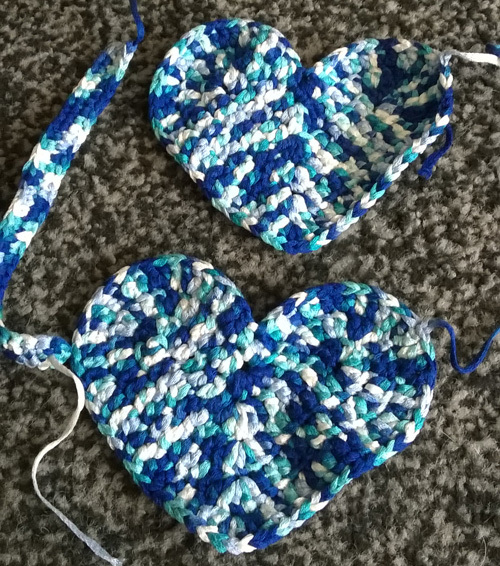 Today I am continuing my crochet UFO review and found these hearts I had made in preparation for Teacher Thank You Gifts which will be needed soon. I thought I would fill them with pot pourri. There is enough here for one, a few more still needed to do. 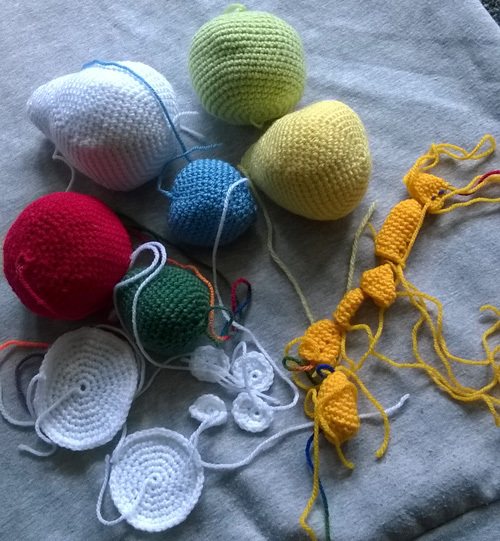 This entry was posted in Amigurumi on June 16, 2015 by blackflowercreative. Having shared my unfinished projects from my holiday I thought I would look through my crochet box for other U.F.O’s and hopefully by pointing them out, maybe inspire myself to finish them. This project I was working on around Christmas time when I was playing with basic shapes. It is the beginning of some Angry Birds. The strip of yellow is a selection of carefully planned beaks according to reference material, however, it will take some detective work now to remember which is which…..
It’s so silly that all that hard work was done and yet I stalled at the final hurdle. Shouldn’t take long to refigure and finish. Watch this space. 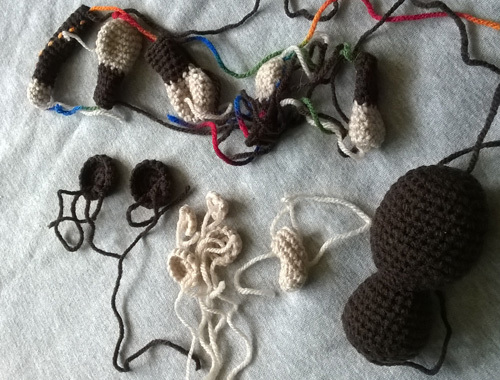 This entry was posted in Amigurumi on June 13, 2015 by blackflowercreative. Further to my previous post, I would like to share the other project I started on holiday. Here it is. This is obviously a Koala (a rare taupe version to the common grey). I hope you like my rainbow wool which I use in the majority of my projects to mark my rows as it shows up clearly. I use long lengths and work multiple pieces on the same length which helps keep all the pieces together. This is particularly handy when working various projects at the same time and if projects don’t get finished and end up as another sad UFO. 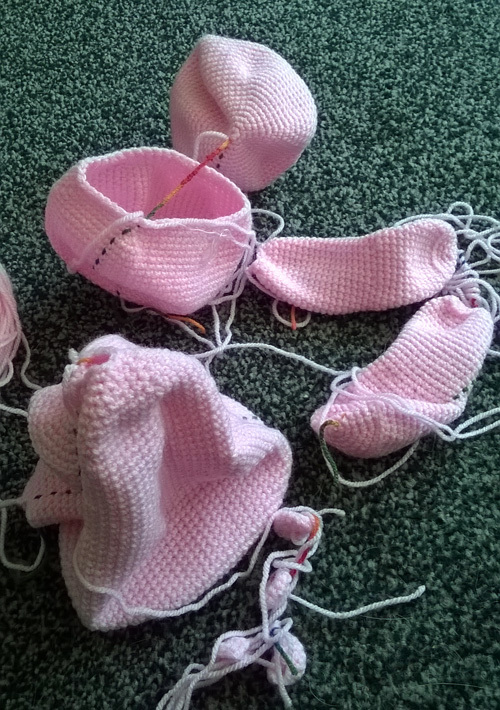 This entry was posted in Amigurumi on June 11, 2015 by blackflowercreative. I haven’t had any time this last week to prepare anything to show you I’m afraid so instead I thought I would share the oddities that I brought home with me from holiday. I hurriedly packed with me a couple of random balls of wool and a lovely Amigurumi magazine and had no intention of doing anything specific. 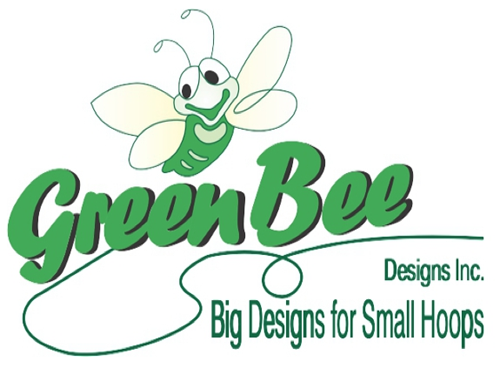 This is one project I started …. It is of course the beginnings of a “Hippo”. 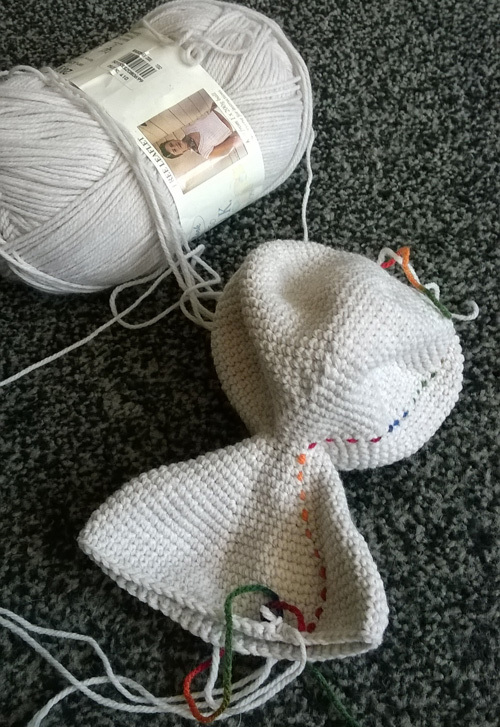 It only got this far because I ran out of my 100g ball of wool. It would have to wait until I got home to buy another ball. In my haste of getting started I failed to read the requirements for the project and assumed it would be a small figure like all the other things I have made have turned out to be, however, this one is a whopper and says it needs 3 balls of wool. Ooops! As I obviously didn’t take stuffing with me either, I left a sufficient length on each piece to finish the last 2 rows once stuffed back home, I hope. 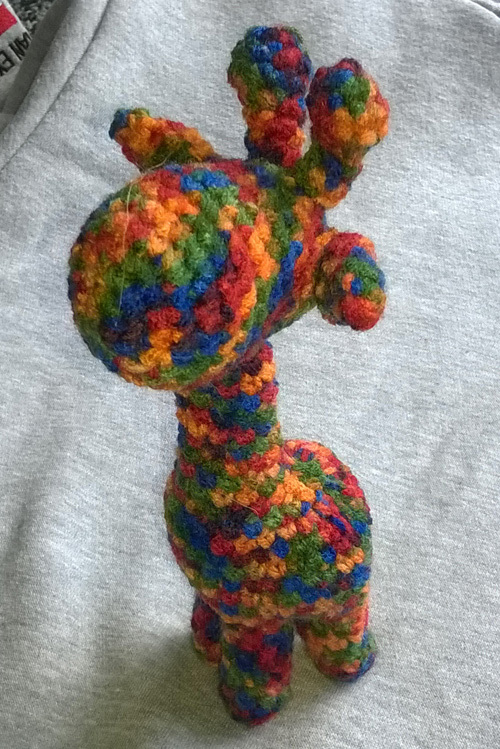 This entry was posted in Amigurumi on June 9, 2015 by blackflowercreative.